Mike's 2d work is primarily completed in acrylic / mixed media. He sees his work as an emotional response; an attempt to capture the spirit and ambiance of a subject, rather than being a photo realistic representation. Texture and colour are usually strong features of his work. Mike has a studio in both Kent and in the Loire Valley, France; dividing his time between them. His work is contained in many private collections as far afield as Cyprus, Thailand and Australia. 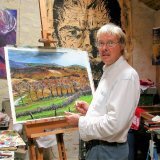 He loves the work of Turner, Moore and Piper and also considers himself fortunate to have occasionally worked under the guidance of the Welsh artist, David Tress. All of whom he feels have influenced his work. 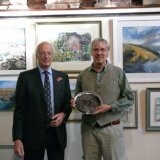 Before moving to Kent two years ago he spent all his working life in Shropshire where, in 2011, he was awarded the Harrison and Walker prize for the painting judged to best capture the essence of the county. He is now looking forward to exploring the exciting new vistas which Kent undoubtedly provides.